During the day Dave specialises in the installation and maintenance of domestic and commercial sound systems. Then come afternoon, evenings, and weekends, this passionate yet very professional music buff hits the road entertaining guests and large crowds all over the South Island and greater Canterbury region as DJ Dave. 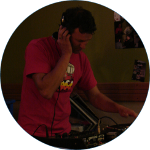 What makes DJ Dave different? With absolutely every taste of music for every occasion right at his finger tips, disc jockey Dave King can help you create a unique event, which is remembered with a smile and talked about for months. 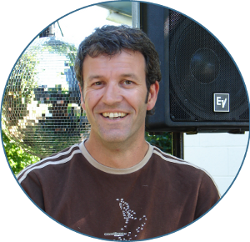 With over 20 years experience both in New Zealand and overseas, coupled with a Diploma in Sound Recording & Engineering and his professional yet energetic approach; Dave has the skills and experience to help make your next event a great success. Hiring DJ Dave is great value! For your next event he will typically entertain for up to 5 hours without a break or longer if required, carry an extensive range of great songs from the 50's right up to the latest dance tracks, not to mention an excellent selection of records too, varying the style of music to suit the occasion. Dave operates a modern meticulously maintained commercial sound system with excellent clarity and plenty of punch when required. Throughout the evening he actively encourages requests, makes special announcements, and not to mention seamlessly works with any unexpected change of plans. A cluster of sound activated lighting highlights the dance floor with accessories such as a microphone, mirror ball etc. easily arranged. How to ensure your event is a great success? As with every success preparation is the key; and Dave King is no exception. From your complimentary meeting to discuss your event ideas and requirements to providing the ideas and suggestions, creating song play lists if required, to arriving on time and appropriately dressed for the occasion; Dave King is your first choice in brilliant entertainment!